The Austrian Obesity Society Annual Meeting will be held in Innsbruck 21-22 October 2016. Join scientists, physicians and other health care professionals from across Europe for this important meeting, which will be held in German. Obesity is a major challenge for our communities and health systems, particularly in light of the numerous comorbidities involved with this chronic disease. The aim of the 2016 annual meeting of the Austrian Obesity Society is to share new scientific knowledge about pathophysiological explanatory mechanisms and current preventive and therapeutic measures on obesity – in practice-relevant form. For talks and conference contributions, we were fortunate to attract experts from across Austria and Germany. In cooperation with the Austrian Society of Endocrinology and Metabolism, we have designed a session on endocrinological aspects of obesity, including the effects on bone metabolism. classical cardiometabolic comorbidities of obesity, as well as psychological aspects of the disease. Sleep apnea syndrome and heart failure will also be covered through Congress presentations. With respect to the therapeutic possibilities there will be a presentation of current data on drug treatment options, the importance of exercise programs, the effectiveness of diets and formula diets and bariatric surgery will be reviewed. The description of the care situation following bariatric surgery will crucially include the perspective of the patient. A special focus is afforded nutritional therapy, especially the influence of SSBs in the development of overweight and obesity in children, adolescents and adults. We will include discussion of the possibilities and limitations of non-drug treatment of dyslipidemia and the importance of diversity in the diet. Greetings Ana. It was good to meet you at the European Congress on Obesity in Gothenburg. Please tell us a bit about yourself; where are you from, where did you grow up? Where do you live now? I was born in Lisbon, and grew up in Portugal until my early twenties, when I left for New York to study at the Rockefeller University at the turn of the second millennium. Two years before, I lived in Paris for a year while conducting part of my undergraduate studies in mathematics. I moved back to Portugal 2.5 years ago to set up my lab at the Gulbenkian Institute. Time flies! One year ago I married a charming Dutchman and moved to an apartment in a lovely historical building right at the beach. We just adopted a big, adorable puppy dog! In addition to my bench work, I am also committed to reaching the public. Scientific education for the general public is the most important means of preventing stigmatization and prejudice against patients with obesity. 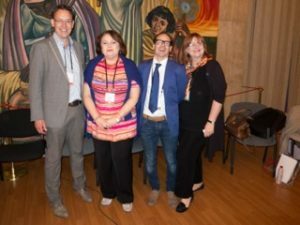 My participation in the Media Masterclass workshop at the European Obesity Summit in June 2016, involvement with patient organizations and various local TV shows in Portugal, as well as art projects that involve the science, such the Nexus Project at the KunstKraftwerkLiepzig, in Liepzig,Germany are important parts of my work – and my community activities. I love to cycle! I have been a cycling commuter since my days as a student in NYC, and now I bike to work everyday along the beach. Where I live there are few bike commuters and a big car culture, even though the weather is great. Cycling is a very efficient way to get vitamin D, exercise, and reduce my carbon print. I´m sort of a bike activist! It´s my hobby, and it takes time and engages me with the local community. Often it is like talking to a wall, but I am persistent! Leptin resistance is a disease model that conceptually resembles that of insulin resistance, drawing a parallel between obesity and type 2 diabetes. Leptin resistance explains the kind of obesity that does not derive from leptin deficiency. The later can be cured by leptin injections, just as insulin deficiency can be managed with insulin injections. However, insulin injections do not cure insulin resistance in type 2 diabetes. Likewise, leptin injections do not cure leptin resistance in most cases of obesity. Thus finding biological ways to get around leptin resistance in the brain, would pave the way for the development of anti-obesity therapies. Please tell us about your lab and current research projects. I have 6 great female scientists working with me. My graduate student Roksana Pirsgalska, who is a fellow of the MIT/Portugal PhD Program, pushed forward a series of results which were recently published in Cell. We discovered that sympathetic (SNS) neuro-adipose junctions mediate lipolysis and fat mass reduction, and are a peripheral effector arm of leptin action in the brain. We discovered that local stimulation of SNS inputs onto white adipose tissues (WAT) induces fat break-down and its consequent depletion. Thus targeted pharmacologic activation of SNS inputs onto WAT could represent a new strategy for the induction of fat loss that would circumvent central leptin resistance as well as the challenges of drug delivery to the brain, across the blood brain barrier. In one of our projects we aim to identify drug targets in SNS neurons innervating WAT, which are suitable for an anti-obesity therapy. We are also modifying potent anti-obesity drugs so that they target these neurons, and become suitable for long term use, and sustained weight loss without severe side effects. How did your original interest in the field develop, and how did you come to focus on obesity? I became fascinated by the topic of obesity when I first heard a talk by Jeffrey Friedman before he came to be my postdoctoral mentor at the Rockefeller University. This was the first time I heard about Jeff´s discovery of the hormone leptin – a breakthrough discovery that changed the way we think about obesity. Jeff´s discovery of leptin transformed obesity into a biological problem, rather than a lack of will power relating to food intake and exercise. The way he then explained the molecular and biological basis of obesity was truly a revalation to me, creating a new reality that is still unknown to many patients and health care providers. Jeff has been a role model and a valuable guide along with my PhD advisor Leslie Vosshall. Both are unique and interesting personalities who create science that can change society. For me, they have been really inspiring. Before receiving a PhD in neurobiology working with Leslie Vosshal at New York’s Rockefeller University, Dr Ana Domingos studied mathematics at the Universty of Lisbon. She started her obesity research career in 2006 at Rockefeller as a postdoctoral associate of Jeffrey Friedman, who discovered the hormone Leptin. As a postdoc, Dr Ana Domingos used optogenetic tools to identify a neuronal circuit in the brain mediating the reward value of sugar. She discovered that Leptin has a regulatory effect on this circuit, influencing how much one likes sugar. In the fall of 2013, she started the obesity lab at The Gulbenkian Institute in her native Portugal. Domingos´ lab was the first to visualize the long-time conjectured peripheral neuron-adipose junctions in the adipose tissue. Furthermore, her lab demonstrated that localized activation of these peripheral neurons is sufficient for lipolysis and fat mass reduction. Thus direct and targeted pharmacologic activation of sympathetic inputs to adipose tissues could represent a novel strategy for the induction of fat loss, and a new anti-obesity therapy that would circumvent the challenges of drug delivery to the brain. These findings were published in Cell, and were widely disseminated in Nature and Science as well as Cell Press. Dr Ana Domingos has received widespread international recognition, including awards from The Human Frontiers Science Program and the European Molecular Biology Organization. Dr. Grace O’Malley chairs the ASOI and works as a research-clinician in the area of childhood obesity. She is a member of the EASO Childhood Obesity Task Force and the European Childhood Obesity Group. Dr. O’Malley is a founding member of ASOI and serves on the Editorial Boards of a number of obesity-related publications. Her research focuses on the pathogenesis and therapy of childhood obesity and related co-morbidities, along with the use of novel treatments (ICT based and mobile health) for the prevention and treatment of obesity. In her role as Clinical Specialist Physiotherapist, she highlights the role of physical fitness for the prevention and treatment of obesity in children. Dr. O’Malley, please tell us a bit about yourself: where are you from, where did you grow up? Where do you live now? I am from the ‘Fair City’ Dublin Ireland. I have lived here for most of my live save for some training and research experience in South Africa and North America. Outside of work I love to cycle, walk by the sea, grow vegetables and flowers in my allotment or cook. I also love music so try my best to spend as much time as possible playing guitar and singing. When time allows, I enjoy exploring new places and I’m very grateful that I have been able to travel quite a bit…long summer holidays during college were great for this! We would like to learn more about your clinical work with children and teens with obesity. As a physiotherapist I am keenly interested in understanding barriers which may or may not exist. Being aware of such barriers is vital in order to maximise the potential, wellbeing and independence of those I work with. The physiotherapy discipline involves assessment and treatment planning, encompassing multiple body systems including the respiratory; cardiovascular; musculoskeletal; neurological and genitourinary systems. Around 10 years ago, children with obesity started presenting more often to our physiotherapy department with joint pain, balance problems, breathing difficulties and continence issues. These children were diagnosed with simple obesity. However there was very little offered in our hospital in terms of evidence-based treatment. From that time, I worked with a team of progressive clinicians to develop an obesity service. My main clinical focus is on assessing the strengths and difficulties the child/teen has from a physical perspective, and includes testing of the musculoskeletal and cardiorespiratory systems to measure motor skill, balance, strength, gait and aerobic capacity. Regardless of the shape, size or ability of a child, these parameters of physical fitness influence how the child will play and participate with their peers. The prospect of future diabetes, stroke or heart disease may be in the distant future for many children, however the issues of social isolation, bullying and not being able to play with peers are far more important during childhood itself. Thus focusing an assessment on their concerns is key to building a good relationship and is very often crucial to subsequent treatment success. Children and their parents are often more concerned about falling, being excluded from games in school and not being able to wear clothes they like than they are about their metabolic health! Treatment involves developing a tailored plan for each family based on current knowledge from the areas of exercise therapy and training, motivational interviewing and goal setting. In our centre we offer both one-to-one care and group-based treatment – we are lucky to have nursing, paediatrics, dietetics, psychology and physiotherapy working together. Working with children who are clinically obese poses unique challenges in that there are often multiple physical and psychological co-morbidities present, obesity may be a symptom of more complex psychosocial difficulties within the family, or often we are trying to encourage families to change aspects of their lives in an environment that is unforgivingly obesogenic. The work is, not only incredibly rewarding (as offering care at an opportune time really can change the lives of the families we see), but also provides tremendous opportunity to learn much about how the human body responds to a changing environment. Please tell us about your research project using tech to improve management of clinical obesity. I was lucky to spend some time at the Yale Obesity Clinic working with Prof. Sonia Caprio and Mary Savoye. Throughout my time working with the Bright Bodies intervention and in clinic, I became acutely aware of a serious supply/demand obstacle. Even in a service that was producing substantial effects and world-class research, there was a limit in the numbers that could be treated. When I returned to Ireland I became interested in the potential for mobile-health tools to bridge this gap in access to treatment. Unlike the programme available at Yale, childhood obesity services in Ireland were wholly under-developed and best-practice treatment was only available in Temple Street Children’s University Hospital. Many families in our service commented on the often negative experiences they had when engaging with the healthcare system. Parents often expressed how the healthcare professionals they met blamed them for their child’s obesity and made them feel like they were ‘bad’ parents. As such, I felt it was really important to develop some sort of mHealth system that was evidence based and could be used in conjunction with available treatments. Even if an online treatment was not as clinically effective as best-practice in-person care, there was a chance that it might be better than looking for help from healthcare professionals with little experience and negative attitudes which could potentially have an iatrogenic effect. I was successful in my application for a PhD fellowship with the Health Research Board of Ireland and began working on a PhD in Medicine (Epidemiology and Public Health) which sought to explore how technology-based tools could be integrated into the clinical care of obesity. I developed my PhD under the wonderful mentorship of Prof. Ivan Perry at University College Cork and we succesfully applied for additional funding from the Children’s Fund for Health at Temple Street and the National Children’s Research Centre, We first spoke to our patients to learn what type of technology they would find acceptable and began development on an Android application and remote system that could be used in treatment. We then designed a usability study and a clinical trial that could test the effectiveness of using the system. The front-end application uses best-practice evidence for behavioural change in an attempt to facilitate health promotion and weight management in teenagers with obesity. The trial is ongoing and our next step is to figure out how to sustain the service, as our research funding is coming to an end. Very interesting Grace, and a real opportunity to support an important intervention for the right funder. How did your original interest in the field develop, and how did you come to focus on paediatric obesity? My original interest came from seeing children present for musculoskeletal injury and fractures. I began to consider how physical barriers early in life could impact participation in health-enhancing physical activity. As I read more and listened to the life stories of patients and their parents, my first-hand understanding of the social determinants of health increased and I began to consider and integrate a perspective of the bigger picture – that is, how the food, physical activity, agricultural, media and economic environments effect these little developing human bodies. Can you share some of the particular challenges of your work? And perhaps some of the joys? The challenges are many as there are few areas of health and medicine that provide so many barriers. Firstly stigma and discrimination are rampant within schools, healthcare systems and the media. One of my patients with a very complex situation overcame his physical and psychological barriers. He had sustained a very complicated fracture/dislocation of a lower limb, and had developed a lot of anxiety and fear of people, but through treatment he managed to get moving and go outside again. He was doing well until a complete stranger stopped his car one day and screamed abuse at him on the street – why – because of his shape. He was devastated of course, and it knocked him back again. Funding is a big issue as everyone working in this area knows (particularly those developing non-pharmalogical interventions). In addition, many of our families have difficult social circumstances and the emotional impact can be a challenge. At a macro-level, our current economic model is a challenge where profit seems to dictate how we organise our communities, our social supports and structures. The unbridled marketing of unhealthy edible products as ‘food’ is unacceptable to me and at a local level our Irish society (ASOI) has been supporting initiatives to limit childhood exposure to this. These challenges are felt throughout Europe by those working in this field and thankfully through EASO and the European Childhood Obesity Group I have personally had an immense amount of support and encouragement to keep going. The professional network is so important and through it I’m delighted to have made good friends too. Thankfully, the joys balance out the challenges of working in this area…hearing a young child tell you that they can play at school and have made a new friend since starting treatment is heart-warming. Often patients attend having received a recommendation from someone at school or work and this encourages our team to feel like we are doing something right. When we play games and exercise with the children in our group programme (www.w82go.ie) we watch with pride as the children become more fit and more confident, encourage one another, and develop friendships. We all laugh a lot during the sessions and they are positive times for us all. Some of our patients have engaged with the media to highlight the condition of obesity and the importance of treatment. We are very proud to see these young people represent themselves in the media and speak articulately about how obesity has affected their young lives. Ultimately, seeing how our support can empower families and facilitate fundamental change is really rewarding. We intend that each of our patients develops and reaches not only their ‘health potential’ but also their potential in school, in their social interactions and within their families. The COTF has recently published a position statement declaring that childhood obesity is a chronic disease in children and adolescents, requiring specialised treatment. Do you foresee any changes as a result of this declaration? I think without careful engagement with the media this statement will polarise the public, particularly online. There is so much to do with regard to increasing the public’s understanding regarding ‘why’ COTF consider clinical obesity as a chronic disease in childhood. Hopefully this statement will facilitate access to treatment for patients and will encourage the very best planning and honorable actions from our scientists, healthcare professionals, educators, policy makers, industry partners and public representatives – as we find ways to address the biopsychosocial drivers of obesity, in an effort that needs to be similar strategically to addressing climate change. In 2016 the congresses of EASO (ECO2016) and the IFSO European Chapter (2016 IFSO-EC Annual Congress) will merge to create the 2016 European Obesity Summit (EOS2016). This exciting congress will take place in Gothenburg, Sweden from 1 to 4 June 2016. You still have a chance to contribute to the EOS2016 scientific programme. We will accept Late Breaking (Hot Topic) abstracts until 31st March 2016. Abstract submission is free, so please visit the congress website to submit. If you want to make significant savings, remember to register before the early bird deadline of 31st March 2016. Visit the congress website for online registration. We are pleased to announce that the Austrian Obesity Association has issued a Call for Abstracts for the 17th Annual Meeting 2016 in Innsbruck. You are cordially invited to attend. The Deadline for receiving abstracts is 1 June 2016. Join us at Ausbildungszentrum West für Gesundheitsberufe der Tirol Kliniken GmbH in 6020 Innsbruck, from 21 to 22 October 2016. On 13th January 2016 EASO convened a Roundtable meeting on obesity in Brussels. More than 30 stakeholders took part in the discussion, including medical professionals, patients, representatives from the World Health Organisation (WHO), Members from the European Parliament (MEPs), and some of the leading European organisations involved in the many illnesses for which obesity is a gateway disease.